Buyproxies.org Review 2019: Why 4.6 Stars & Is worth to use BuyProxies? (4.6 / 5) Write a Review! Buyproxies.org is a big player in the ever-growing proxy industry. They are one of the popular dedicated and shared proxy providers and have good user feedback. With their high compatibility of websites and high bandwidth speed, Buyproxies.org is a good choice for any general-purpose use as well as SEO purposes, coping sneakers, file sharing websites. Recommended for: Social Media, Cop shoes, SEO scraping, Uploading. One of the pre-requisites of good marketing for any business is having an online presence. Social media can do a charm to attract new customers and increase the followers of your business. Other business strategies include researching what your competitors are up to and to appear as a top result when potential customers are looking for a type of product or service that you offer. For both scenarios, proxies have almost become a necessity. Social media marketing or SEO scraping is now unimaginable without the help of proxies. With the growing need for proxies for businesses and personal use, many proxy providers are now offering quality proxy services, and it has become increasingly difficult for customers to choose from a myriad of proxy services. To aid customers like you with selecting the right proxy for your needs, we have reviewed some of the most popular proxy providers currently in operation and compared their features. In this review article, we will discuss in depth about buyproxies.org and see how it performs. Although started as a small startup back in 2011, Buyproxies.org has now become one of the prominent names in proxy service with their continuous improvement. They have a highly active customer support center which has mostly positive feedback. They also have a high rating in several proxy checker websites. To verify their claims and test their proxies ourselves, we bought 10 of their dedicated proxies and used the proxies for a week. Unlike many other reviews found online, our review not only tests the important proxy parameters but also takes user perspective and usability into account which we believe plays a crucial role in sticking with the service for a long time. You can find a brief comparison of what we liked and did not like about their service as a whole. High anonymous dedicated and shared HTTP/HTTPS proxies. They are the owner of their servers, so do not need to resell. Proxies from the USA and Europe. Very inexpensive and even more so when purchased in bulk or for a longer duration. Specialized packages for shoe sites and Ticketmaster. Option to refresh proxies each month. Delivery of proxies in under three minutes. Extremely efficient and cooperative customer support center that is active 24/6/365. Two authorization methods are available – IP Authorization and Username and password authentication. Several payment methods accepted including Paypal, Bitcoin, Bank transfer etc. Ping is not much desirable, but acceptable. Refund is available only for first 24 hours. Buyproxies.org offers both dedicated proxies for you to use alone or shared proxies, which is shared between multiple users. The benefit of using dedicated proxies is, your connection bandwidth is not shared by anyone else, so you get the full speed to yourself. Since no one else uses the same proxy IPs, it also means that there’s practically zero chance of getting your proxies banned due to misbehavior of other users, which is almost always the case for shared proxies. In this review, we’ll focus on their dedicated proxies. The proxies are classed as Elite high anonymous. These are HTTP/HTTPS proxies only and does not support SOCKS4/5 proxies. During our review period, Ticketmaster proxies were sold entirely and were not available for new purchase. The price of the proxies offered by Buyproxies.org is very affordable and suitable for any new small or medium businesses to get going. You can get the proxies at an even lower rate if you go for a bigger package or choose to buy proxies in advance for longer commitments. We have compiled the present proxy package plans offered by Buyproxies.org in tables below. Buyproxies.org servers in the USA & Europe, all of which are owned by them. These servers are eco-friendly, meaning the heavy-duty servers have a less adverse impact on the environment. However, we could not extract any more information from their website. They do not disclose the cities their servers are located in and also don’t let you choose from all the available locations while buying proxies. But since one of their proxy packages offers up to 30 distinctive locations, we can assume they have servers in at least that number of cities across the USA and Europe, which is quite good. But knowing the available proxy locations might be helpful for many to decide whether to go with this particular service as often specific locations are needed for Craigslist or similar other location-specific websites. To review the proxies, we performed several tests on each of the ten proxies we purchased from Buyproxies.org. Among these tests are – ping test, speed test, geo-location test, and IP compatibility test. You can find details on our tests on the following sections. The first test we performed was to check the response time of the servers by pinging to the IPs. By pinging a server from multiple locations, you can get a general idea about the server response time and the expected delays. You can also have a rough estimate about how far the server is located from the pinging location. To perform this test, we used an online testing service, whoer.net and noted the ping time from three locations. The response time was generally acceptable, although it would’ve been much appreciated if the pings were less than 50ms at all times. Still, a ping less than 100 ms is impressive too. There should be no hiccups while general browsing or using bots to scrape web pages. The effect may be accentuated for online gaming, which requires significantly low ping. We also threw in the ping by Speedtest.net that we received during our speed test. Speedtest.net calculates ping by connecting to the nearest available server, so the ping is comparatively low. You can find the ping test details below. The next test we performed on the proxies was to check the connection speed. This gave us an overview of the proxy speed and the best scopes of applications for the proxies. We used the world’s most popular network testing tool, speedtest.net to determine the upload and download speed for the proxies. Our tests show that 30% of the allotted proxies have a very high-speed connection with over 60 Mbps download speed and 70% proxies have ultra-high upload speed, clocked at as high as 411 Mbps. We are confident that the speed was not bottlenecked by our internet connection speed since we have a download/upload speed of 84/1418 Mbps and the proxies speed did not come near that. What concerns us are the rest 70% proxies that much lower download speed which is not suitable for heavy-duty tasks such as streaming, file sharing and so on. But, the average speed of 6 Mbps of these proxies should be good enough for general web browsing, bot applications, and other low power tasks. Many people use proxies for the sole purpose of appearing from other locations to access contents or services unique to those locations. So, it is of high importance for the proxies to be able to properly conceal the original location of the user and mask with the proxy server location. To test whether the proxies provided by Buyproxies.org can do so, we tested the proxies for their location. The geolocation test also helps us understand how diversified the proxies are and if the proxy IPs are sequential. We used the website iplocation.net to aggregate location data from 4 prominent geo-location tracking services. The data for each IP was then compared to determine the highest probable location for the specific IP. This was then done for all 10 IPs. Seeing the table below, notice that the IPs are from New York and Georgia since the package allows a maximum of two locations. Although the IPs are not sequential, being from the same locations and probably the same server, several of the IPs are of same subnets. The last test we performed was perhaps of the highest importance. This test checks whether the proxies can access some of the major websites. Since many providers often recycle proxies, some proxies can be banned on some sites due to the usage of previous users of the proxies. Again, some providers restrict access to some websites to promote their specialized packages for the sites. Fortunately, Buyproxies.org passed our IP compatibility test remarkably well. All 10 of the proxies we obtained from them could access the ten popular websites we use for the test. Also, while we were purchasing the package, we mentioned the usage to be on Instagram, but other social media sites work just as fine. You can rest assured that since we could access social media sites, shoe sites, shopping sites, SEO scraping site, ads site, Buyproxies.org does not restrict access to certain types of sites. If you ever face problem while accessing a website, contact their support to resolve the issue. Buyproxies.org offer highly anonymous shared and dedicated proxies. These proxies are of elite class and so do not share your information with the websites you are visiting. 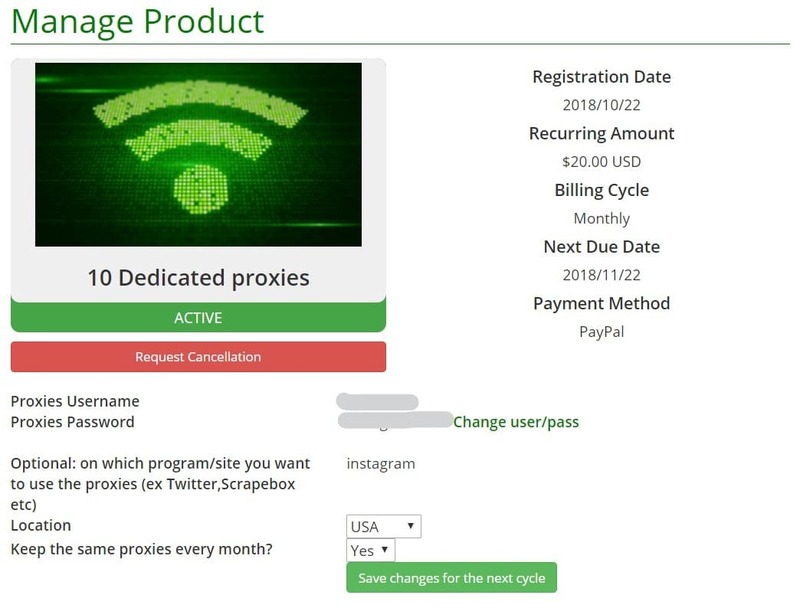 Buyproxies.org allows you to configure the proxies either by ensuring username and password combination you set during buying proxies or by authorizing some IPs, only which will be available to connect to the proxies. However, only 2 IPs can be authenticated at a time which is significantly lower. A handy feature offered by Buyproxies.org is that you can get an API from the control panel which can be inserted in several bot software. 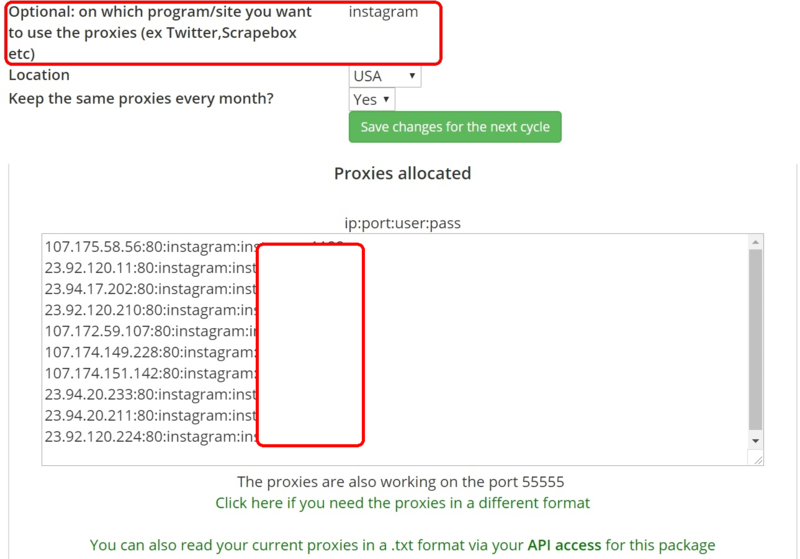 This API can automatically pull your proxy list, and so you will not need to manually input the proxies each time after you refresh the proxies. Buyproxies.org has a unique Chrome browser extension which has instantly become our favorite after we started using it. 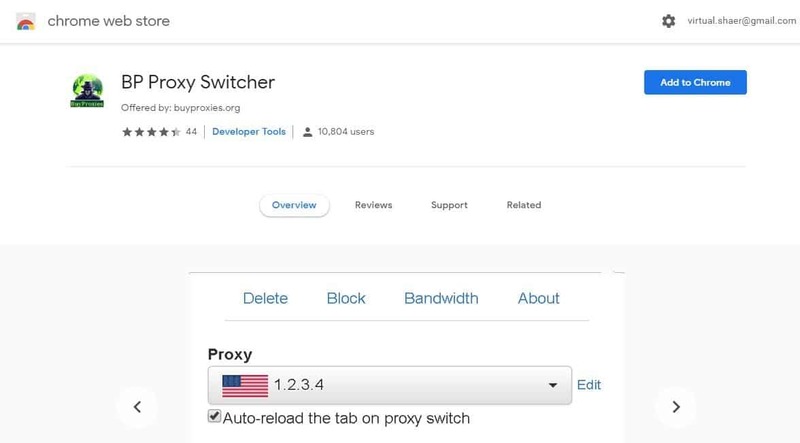 The BP proxy switcher add-on is a convenient app to set proxies in your Chrome browser. The addon can automatically shuffle between proxies, change the user agent, and has a lot of available options to tweak according to your needs. But the most amazing thing is, the add-on is not restricted to Buyproxies.org users only. 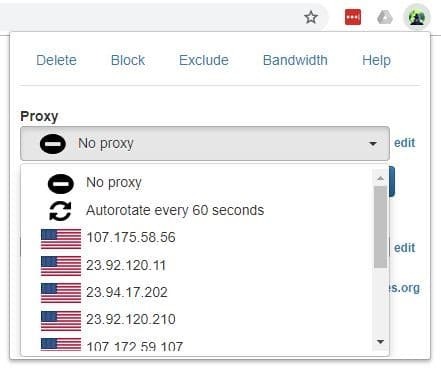 Instead, anyone using any proxy service can use this add-on to set the proxies easily. You can choose to have a new set of proxies each month. This can easily be done by a click of a button in the user control panel. So, no need to hassle and contact customer care each month. While some proxy providers like to verify your transaction and keep you waiting in the process, Buyproxies.org understands the value of your time and quickly allots you the set of proxies. And by quick, we mean really quick! We received the email containing the proxy details in under three minutes of making the payment through Paypal. The entire process is automatic, so you do not have to worry about a delay due to human error. Signing up for the service is remarkably easy. You can find links to learn more about their shared/dedicated proxy packages on their homepage. From there you can just select a package and proceed to complete payment. A good thing about Buyproxies.org is that they accept the payment via a myriad of options and you can definitely find a service that is suitable for you. To use the proxies allotted by Buyproxies.org, you need to configure your browser or application with the proxy details. Insert your IP address, port number, username and password in the configuration form. Some applications accept IP:Port:Username: Password format which can be received in a text file from the control panel of Buyproxies.org. You can also authenticate up to two IPs which can be used to access the proxies without using the username and password. Buyproxies.org is one has good features as well as great proxies which were enough to impress us. However, we were a bit off due to their lack of providing more information regarding their servers. We think the proxies should have an increased connection speed with lower ping. Still, these are within an acceptable margin, but they should work on improving this. We would recommend Buyproxies.org for your general-purpose browsing, web scraping, file sharing. And we would definitely recommend using the BP proxy switcher extension that will make your life much more comfortable.